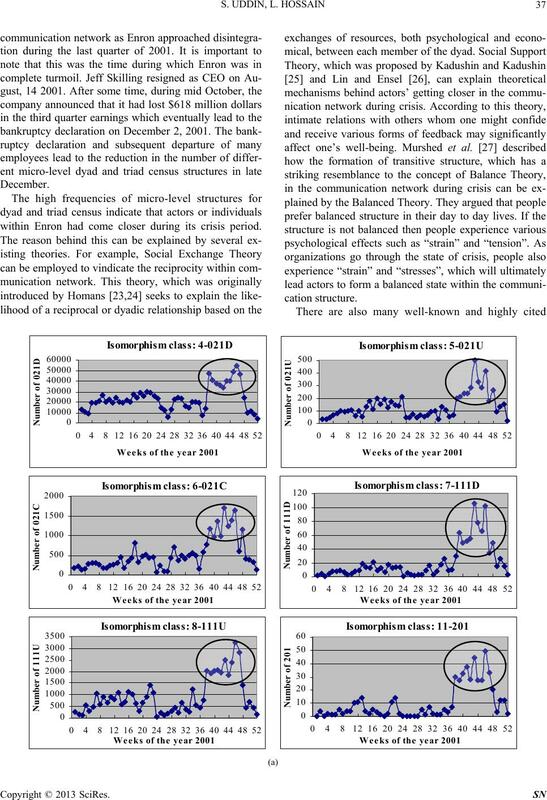 shows more transitivity compared to the non-crisis communication network. popularity in recent social network research [2,3]. characterize various forms of organizational needs . 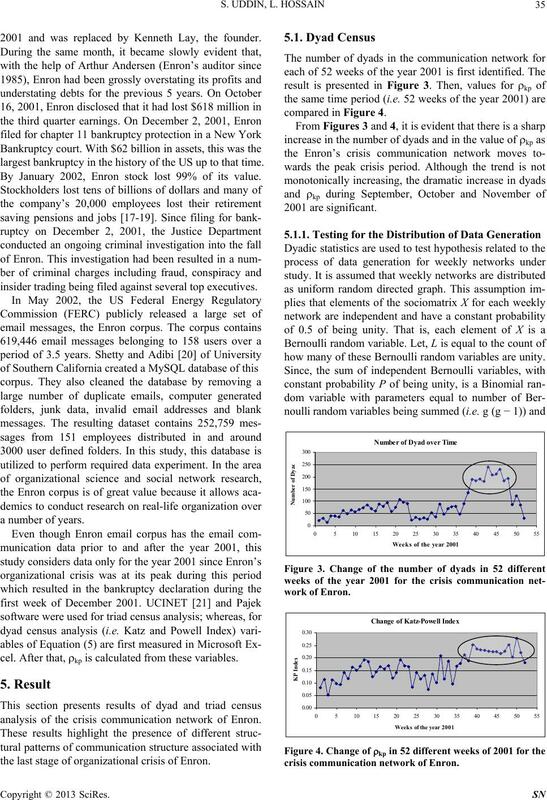 the case of Enron Corporation in the final quarter of 2001.
with the most of their social network contacts (81%). that are at the heart of informal communities of practice. Figure 1. Three dyadic isomorphism classes or states. cells (i.e. Xij and Xji) in the sociomatrix X contain a 0. That means, for null dyad Xij = Xji = 0, and Dij = (0, 0). where, X++ = L, number of links in the network. triads for a network of size g.
a triad, each of these six arcs can be present or absent. 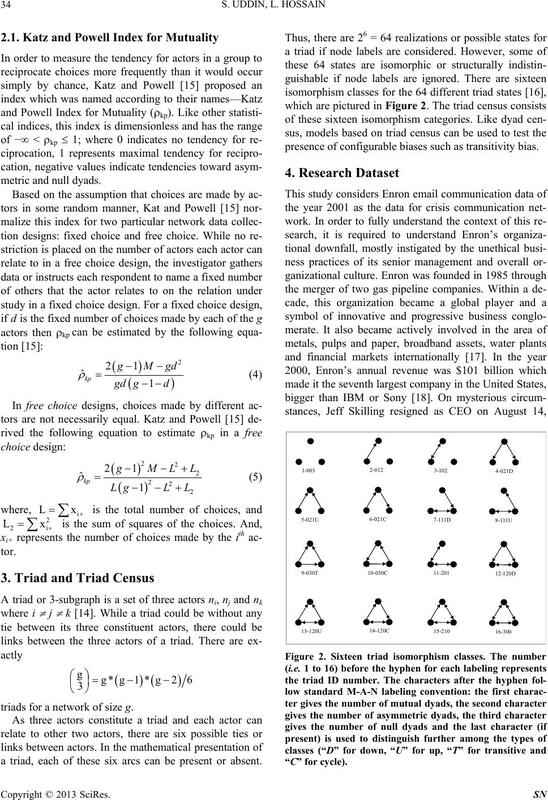 presence of configurable biases such as transitivity bias. 2001 and was replaced by Kenneth Lay, the founder. largest bankruptcy in the history of the US up to that time. By January 2002, Enron stock lost 99% of its value. insider trading being filed against several top executives. cel. After that, kp is calculated from these variables. analysis of the crisis communication network of Enron. the last stage of organizational crisis of Enron. compared in Fi g u r e 4.
how many of these Bernoulli random variables are unity. crisis communication network of Enron. the probability that any one of the variables is unity (i.e. ing crisis and non-crisis period for Enron. tures for which there is an absent link between actors (i.e. in Figure 2) are illustrated in Fi gu r e 6 (b). utilized to test the structural hypothesis about transitivity. ferred as a transitive triple . as that organization experiences crisis. within Enron had come closer during its crisis period. Figure 6. 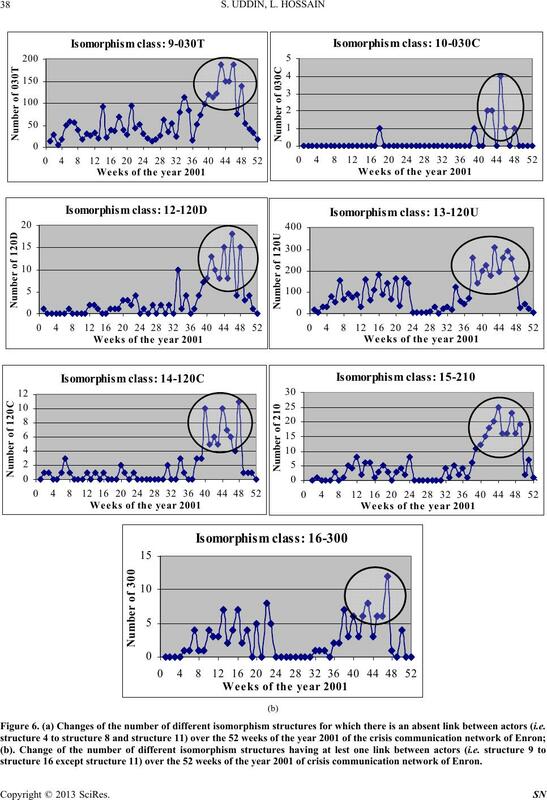 (a) Changes of the number of different isomorphism structures for which there is an absent link between actors (i.e . structure 16 except structure 11) over the 52 weeks of the year 2001 of crisis communication network of Enron. Figure 8. Frequencies of transitive configurations for 52 weeks of the year 2001 for crisis communication network of Enron. others ; and a reduction in inter-group conflicts . communication data in this study. 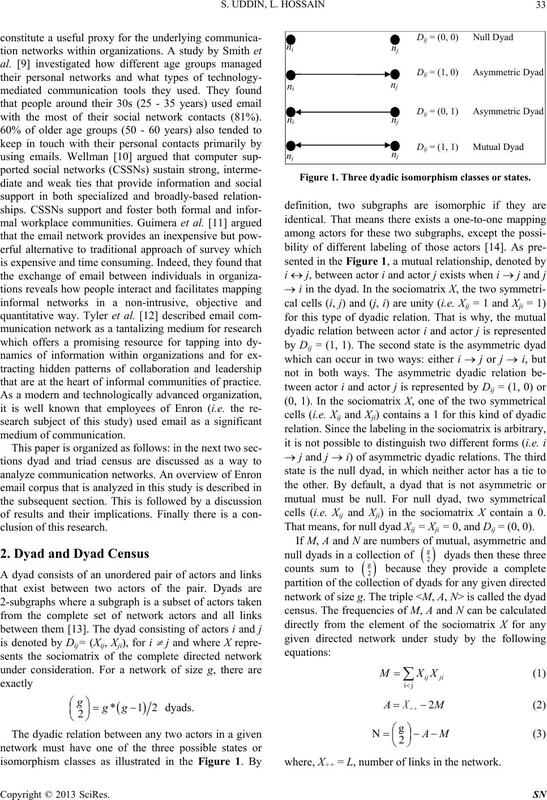 sults from dyad and triad census analysis respectively. tion analysis and stability analysis could be developed. 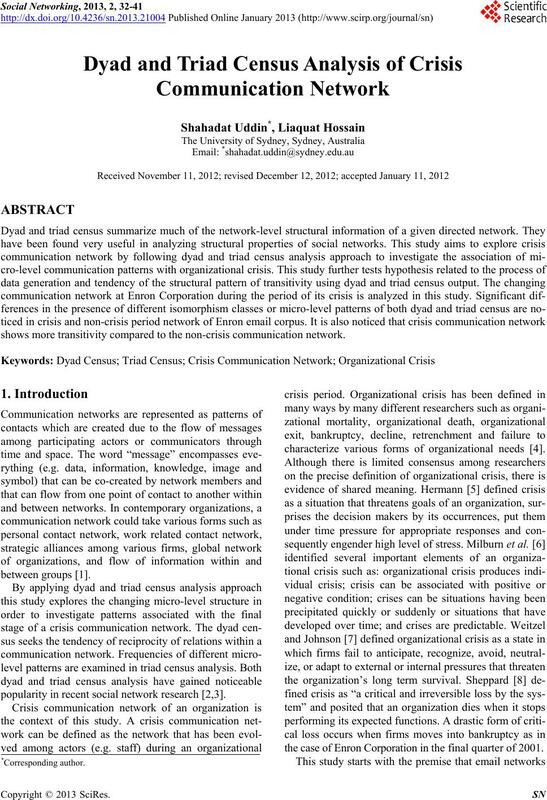 sus analysis for a crisis communication network. Vol. 19, No. 2, 2011, pp. 179-201. 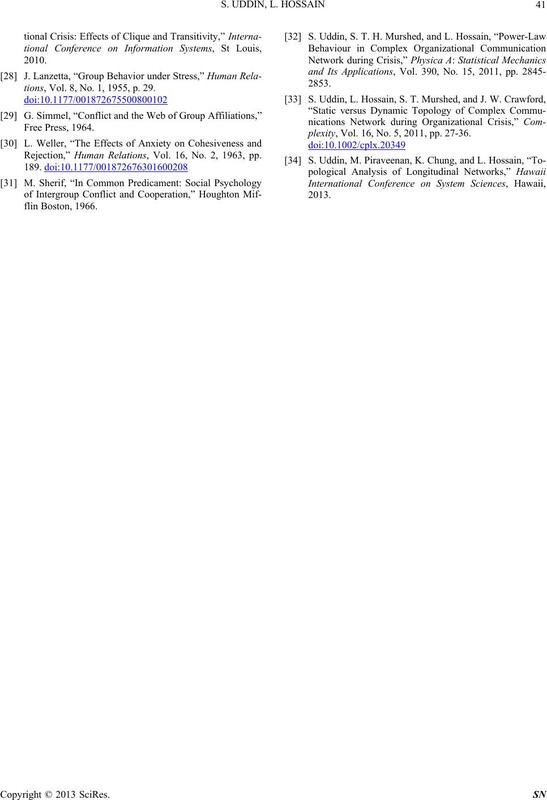 S. Fukuzumi, K. Ohkubo, J. Ortiz, A. M. Gutierrez, F.
views, Vol. 5, No. 1, 2004, pp. 21-41. Quarterly, Vol. 8, No. 1, 1963, pp. 61-82. Relations, Vol. 36, No. 12, 1983, pp. 1141-1160.
ence Quarterly, Vol. 34, No. 1, 1989, pp. 91-109.
into Organizational Death,” Journal of Management, Vol. 20, No. 4, 1994, pp. 795-833.
man-Computer Interaction-INTERACT, Zurich, 2003, pp. R. Guimera, L. Danon, A. Diaz-Guilera, F. Giralt and A.
of Human Interactions,” Physical Review E, Vol. 68, No. ture within Organizations,” The Information Society, Vol. 21, No. 2, 2005, pp. 143-153.
terpersonal Relations in Small Groups,” In M. Berger, J. Progress, Vol. 2, 1967. pp. 218-251.
of Economic Perspectives, Vol. 17, No. 2, 2003, pp. 3-26.
ganizations,” Group & Organization Management, Vol. 31, No. 3, 2006, pp. 327-358.
logical Review, Vol. 29, No. 6, 1964, pp. 809-818. 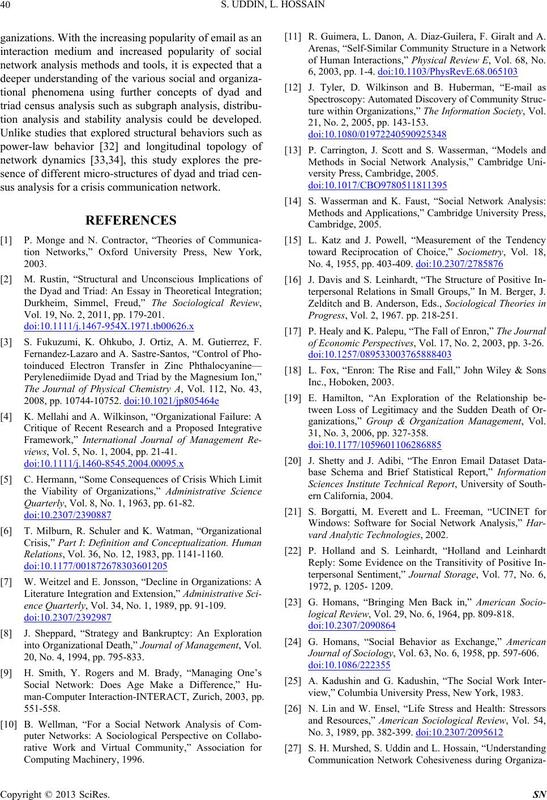 Journal of Sociology, Vol. 63, No. 6, 1958, pp. 597-606.
view,” Columbia University Press, New York, 1983.
tions, Vol. 8, No. 1, 1955, p. 29. Rejection,” Human Relations, Vol. 16, No. 2, 1963, pp. plexity, Vol. 16, No. 5, 2011, pp. 27-36.